Hannan senior Matthew Qualls (1) applies pressure to Teays Valley Christian’s Kevin Cheng during the first half of Thursday night’s boys basketball contest in Ashton, W.Va.
Hannan senior Caleb Gussler (4) releases a shot attempt over a TVCS defender during the second half of Thursday night’s boys basketball contest in Ashton, W.Va.
ASHTON, W.Va. — It was competitive through eight minutes of play. Then came the 10-minute mark. Visiting Teays Valley Christian turned a two-possession cushion into a permanent double-digit lead with an 11-1 charge in the opening two minutes of the second frame and ultimately cruised to a 79-47 decision over the Hannan boys basketball team on Thursday night in a non-conference matchup in Mason County. The Wildcats (6-11) led 4-0 in the opening 90 seconds of regulation, but the Lions (14-8) countered with six straight points before the hosts made another 5-0 run for a 9-6 cushion midway through the frame. Andrew Gillispie gave Hannan its largest lead of the night at 12-8 with a basket at the 3:02 mark, but the guests answered with five straight points to reclaim the lead. Casey Lowery gave HHS its final lead of the night at 15-13 with a trifecta with 1:41 remaining, but TVCS countered with an 8-0 surge over the final 80 seconds to take a 21-17 cushion through one period of work. The Lions had a 2-1 run in the first 30 seconds of the second canto, then hit three consecutive 3-pointers that turned a five-point game into a 32-18 advantage at the 6:15 mark. TVCS nailed 10 of its first 11 shot attempts in the frame and also went 12-of-16 overall — including 5-of-6 from behind the arc — during a 29-9 surge that resulted in a 50-26 contest at the break. 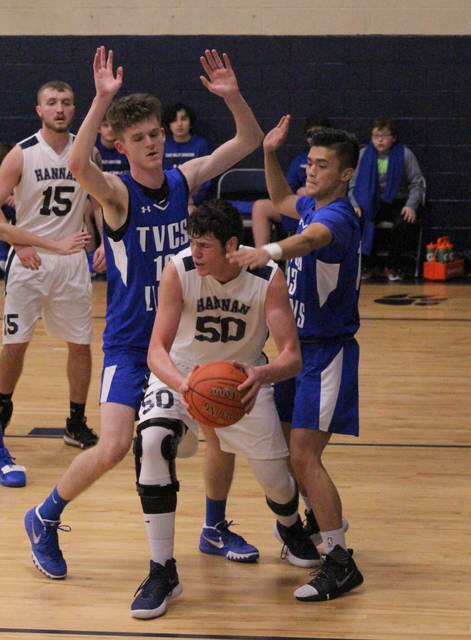 Hannan ended up missing its first four shot attempts of the second quarter and was also 1-for-11 before ending the first half with a 6-3 run over the final minute of play. Both teams shot better than 50 percent from the floor in the first quarter, but the Lions kept their hot hand throughout as the guests made 21-of-32 shot attempts (68 percent) in the opening 16 minutes. The Wildcats, conversely, went just 10-of-27 from the field for 37 percent over that same span. 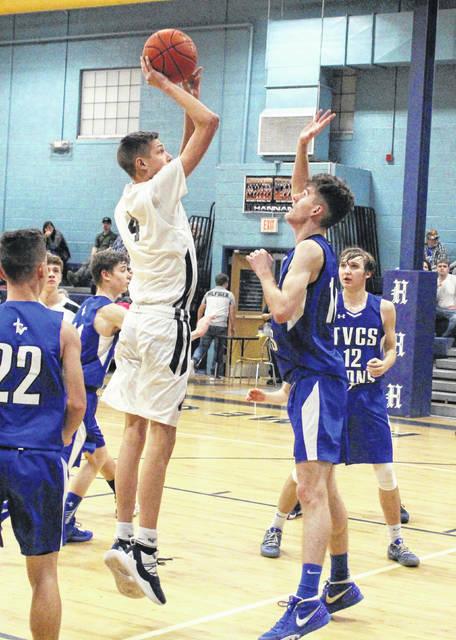 Teays Valley Christian led by as many as 27 points at the end of the third (65-38) and had its lead trimmed to as little as 20 points following five consecutive points from Chandler Starkey at the 2:22 mark for a 56-36 contest. The Lions took their largest lead of the night at 79-43 following an Andrew Thomas basket with 1:52 remaining in regulation. TVCS also captured a season sweep after posting an 85-34 decision at home on Jan. 8. After the game, HHS coach Shawn Coleman didn’t show too many signs of frustration with the outcome. Sometimes, as the first-year coach pointed out, the other team is just better on that given night. “Teays Valley Christian just shot the ball lights out tonight. They’ve got some good shooters and good players, and it showed,” Coleman said. “I thought that our kids played some good defense on them, but the long and short of is that they made a lot of shots. 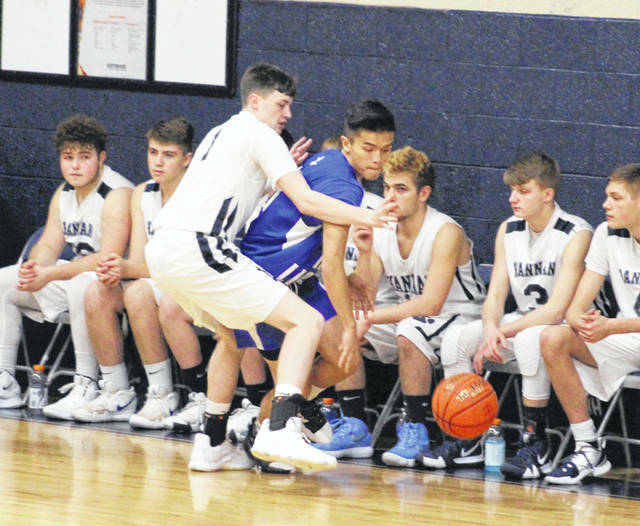 Teays Valley Christian outrebounded the Cats by a 39-30 overall margin, but both teams hauled in 10 offensive rebounds apiece. The hosts committed 12 turnovers in the game, compared to 11 miscues by the Lions. Hannan made 17-of-55 field goal attempts for 31 percent, including a 5-of-22 effort from behind the arc for 23 percent. Lowery paced the hosts with 13 points and seven rebounds, followed by Starkey with 10 points and Dalton Coleman with eight markers. Gillispie and Chase Nelson were next with six points each, while Caleb Gussler and Devrick Burris completed things with two points apiece. Nelson and Gillispie also grabbed four rebounds apiece for the Wildcats, who had 10 different players haul in at least one carom. TVCS netted 32-of-64 shot attempts for 50 percent, including a 12-of-25 performance behind the arc for 48 percent. The Lions had four players reach double figures, with Andrew Bording leading the way with a game-high 18 points. Devin Danford was next with 16 points, while Brandon Cook and Kevin Cheng both added 15 markers apiece. Cole Young contributed eight points and Trent Feazell was next with three points. Thomas and Noah Combow completed the winning tally with two markers each. Young hauled in a team-high 11 rebounds, with Cook and Feazell respectively pulling in eight and seven boards. Hannan traveled to Grace Christian on Friday night and returns to action Monday night when it travels to Buffalo for a non-conference game at 7:30 p.m. The Wildcats also travel to Carter Christian on Tuesday night for a 7:30 p.m. tipoff.